We have developed and utilized the Gravity-guide (G-guide) as a simple manual instrument for intraoperative assessment and adjustment of stem anteversion (AV). Since 2013, we simultaneously measured stem AV using the G-guide and image-free navigation during THA procedure. The purpose of this study was to compare the measurement accuracy of the G-guide and navigation system using the postoperative CT results as a reference. In total, 59 hips in 56 patients who underwent primary THA using both the G-guide and image-free navigation system were included in the study. All patients underwent postoperative CT examination, and the femoral stem AV was assessed using a 3D image analysis system (Zed hip, LEXI, Japan). The AV angle derived from the postoperative CT image analysis was used as the reference value to assess the accuracy of the two intraoperative measurement systems. The discrepancy between the G-guide and the postoperative CT-measured values averaged 5.0° ± 3.9°, while the corresponding value for the navigation system was 5.2° ± 4.1°. Acceptable accuracy with a measurement error of less than 10° was achieved in 86% and 90% of the cases for the G-guide and navigation measurements respectively. Consequently, it was shown that both navigation and G-guide measurements can achieve comparative accuracy and are clinically useful. Keywords: Combined anteversion, Dislocation, G-guide, Navigation, Stem anteversion, Total hip arthroplasty. © 2019 Fujihara et al. In total hip arthroplasty (THA), implant positioning is one of the critical factors determining the surgical outcome. Regarding the optimal implant positioning, Lewinnek defined the “safe zone” of cup alignment as 40° ± 10° of inclination and 15° ± 10° of anteversion (AV) [1Lewinnek GE, Lewis JL, Tarr R, Compere CL, Zimmerman JR. Dislocations after total hip-replacement arthroplasties. J Bone Joint Surg Am 1978; 60(2): 217-20. [http://dx.doi.org/10.2106/00004623-197860020-00014] [PMID: 6410 88] ]. In addition to the cup AV, AV of the femoral stem also plays an important role in determining the longevity of THA; however, there is a paucity of information regarding the optimal amount of stem AV leading to a satisfactory outcome. Recently, the concept of combined anteversion (CA), which combines both cup and stem AV, has been proposed and utilized as a parameter to assess the overall prosthetic alignment [2Widmer KH, Zurfluh B. Compliant positioning of total hip components for optimal range of motion. J Orthop Res 2004; 22(4): 815-21. [http://dx.doi.org/10.1016/j.orthres.2003.11.001] [PMID: 15183439] -9Nakashima Y, Hirata M, Akiyama M, et al. Combined anteversion technique reduced the dislocation in cementless total hip arthroplasty. Int Orthop 2014; 38(1): 27-32. [http://dx.doi.org/10.1007/s00264-013-2091-2] [PMID: 24026219] ]. In our previous study, the CA value (cup AV + stem AV) was evaluated in patients who underwent THA using an image-free navigation for the cup with manual adjustment for the stem [10Fukunishi S, Fukui T, Nishio S, Fujihara Y, Okahisa S, Yoshiya S. Combined anteversion of the total hip arthroplasty implanted with image-free cup navigation and without stem navigation. Orthop Rev (Pavia) 2012; 4(4): e33. [http://dx.doi.org/10.4081/or.2012.e33] [PMID: 23589761] ]. The resultant stem AV value showed wide variability. Consequently, the CA values of patients who underwent THA using image-free navigation for the acetabular side alone showed large SD values (mean 44.4±11.2°). It is suggested that accuracy and consistency in CA adjustment cannot be accomplished with the use of cup navigation alone. In order to improve the surgical accuracy for stem AV adjustment, an upgraded version of the navigation software has been used since 2013 (OrthoPilot Navigation System THA Pro Ver4.2, B/Braun Aesculap Germany: Navi) that enables both cup and stem AV assessments [11Fukunishi S, Nishio S, Fujihara Y, et al. Accuracy of combined anteversion in image-free navigated total hip arthroplasty: stem-first or cup-first technique? Int Orthop 2016; 40(1): 9-13. [http://dx.doi.org/10.1007/s00264-015-2784-9] [PMID: 25947898] ]. However, due to the cost and effort the navigation system requires, we developed a simple instrument as an alternative, the “Gravity-guide (G-guide)”, for intra-operative assessment and adjustment of stem AV. In our previous study, the effectiveness of this system was examined, comparing it to the postoperative CT evaluation, and showed that the absolute discrepancy between intra- and postoperative measurements averaged 4.6°±4.1° [12Fujihara Y, Fukunishi S, Fukui T, et al. Use of the G-guide for measuring stem antetorsion during total hip arthroplasty. Orthopedics 2016; 39(2): e271-5. [http://dx.doi.org/10.3928/01477447-20160201-03] [PMID: 268814 66] ]. Consequently, it was confirmed that the G-guide system provides reasonable accuracy. Following the line of those previous investigations, the next question would be whether the G-guide system can offer equally accurate measurements in comparison to the navigation system that is used in our current practice. The purpose of this study, therefore, was to compare the intraoperative measurement accuracy of the G-guide and navigation system. The patients included in this study underwent THA with simultaneous use of the G-guide and the image-free navigation. Based on the comparison of the intraoperative measurement results, clinical utility and significance of the two systems were comparatively assessed. The study hypothesis was that both the G-guide and the navigation would provide equally effective intraoperative information. This study design was approved by our Institutional Review Board (No. 2198) and informed consent was obtained from all patients. In total, 56 consecutive patients (59 hips) who underwent primary THA with simultaneous use of the G-guide and the navigation between March 2013 and March 2015 constituted the study population. There were 19 men (21 hips) and 37 women (38 hips). The preoperative diagnosis included osteoarthritis secondary to developmental dysplasia in 50 hips (85%), and osteonecrosis of the femoral head in 9 hips (15%). Surgeries were performed by three senior surgeons (YF, YT and SN) using a modified Hardinge approach with the patients in the lateral decubitus position. The image-free navigation system, OrthoPilot Navigation System THA Pro Ver4.2, was used, and the surgical procedure followed the instructions provided by the manufacturer. All the hips were implanted with a cementless cup and stem (Plasma cup and Bicontact stem B/Braun Aesculap, Tüttlingen, Germany). At preoperative planning, target angle of the stem AV ranging from 10° to 40° was individually set corresponding to the native femoral AV. Patients with severely abnormal native femoral AV value of more than 53°or less than 0° were not included in the study population because the native femoral AV angle was not targeted during surgery in those patients. During surgery, the femoral AV value was determined at the time of final rasping of the femur, and the AV angle was simultaneously measured with both the G-guide and navigation system. Finally, stem anteversion was determined according to the navigation value, and the G-guide value with final rasp was recorded for the postoperative examination. Subsequently, the cup AV angle was determined according to Widmer’s formula and was based on the stem AV measured with the navigation system to attain the optimal combined anteversion angle (37.3°). The structure and concept of the G-guide have been described in our previous paper [12Fujihara Y, Fukunishi S, Fukui T, et al. 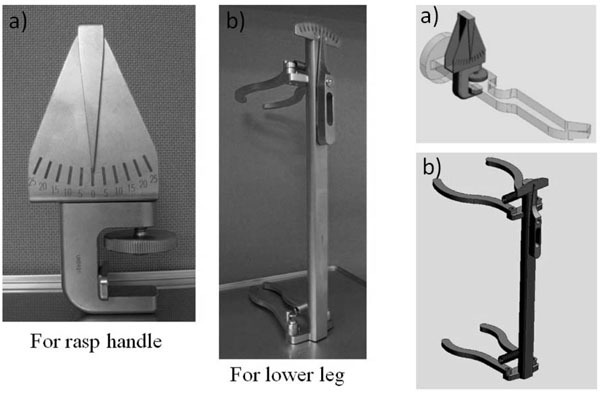 Use of the G-guide for measuring stem antetorsion during total hip arthroplasty. Orthopedics 2016; 39(2): e271-5. [http://dx.doi.org/10.3928/01477447-20160201-03] [PMID: 268814 66] ]. Briefly, this device consists of two parts with one attached to the lower leg and the other attached to the handle of the rasp (Fig. 1 ). The part attached to the lower leg was utilized to ascertain perpendicularity of the lower leg axis. The other part provides information for AV of the rasp. 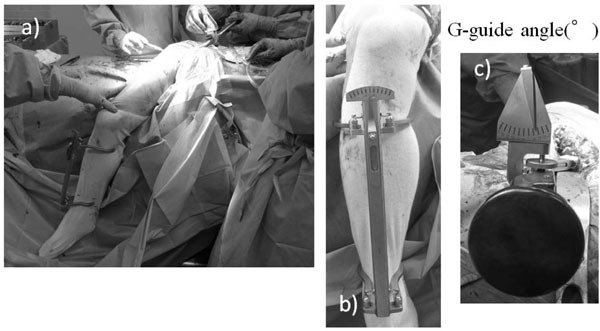 The intraoperative set-up of this G-guide system is shown in Fig. (2 ). a) The first part attaches to the handle of the rasp to measure AT. b) The second part attaches to the lower leg. Intraoperative stem anteversion assessment using the G-guide. a) Overview photograph showing the intraoperative set-up of the G-guide. The G-guide measurement of the stem AV is made at the time of the final rasp insertion. b) One part of the G-guide is attached to the lower leg along its longitudinal axis to ascertain verticality of the lower leg axis. c) The other part attached to the rasp handle provides information regarding the orientation of the rasp corresponding to the stem AV. 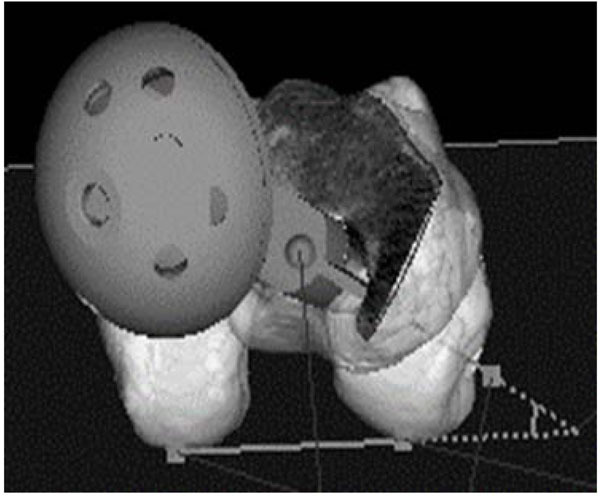 Postoperative CT-based anteversion (AV) measurement using the 3D template system (Zed Hip). Stem AV is measured in reference to the posterior femoral condylar tangential line. Postoperatively, all patients underwent postoperative CT examination, and the prosthetic alignment was assessed using a 3D template system (Zed hip, LEXI, Japan) on those CT images. The stem AV angle measurement with the Zed Hip was made in reference to the posterior femoral condylar tangential line (Fig. 3 ), while the G-guide assessment was referenced to the lower leg longitudinal axis. Consequently, there was a discrepancy between the AV values measured with the G-guide and the CT image analysis. In order to compensate for the difference in the reference line between the two measurements, the angle between the posterior condylar tangential line and the perpendicular line to the lower leg axis was measured on the preoperative epicondylar view radiograph (Fig. 4 ) and utilized as the correction angle. In comparison between the G-guide and CT measurement values, the angle derived from the G-guide system was corrected by adding the correction angle. After the correction was made, the intra-operative G-guide value was compared using the referential CT evaluation value. Discrepancies between the intraoperative measurement values and referential CT values were calculated and compared between the G-guide and the navigation measurements. Statistical analyses for the comparison of the two measurements were conducted using the t-test and the chi-square test. In all analyses, p<0.05 was considered significant. The analysis was performed using IBM SPSS Statistics version 19 software (IBM, Armonk, New York, USA). A priori power analysis was performed to determine the appropriate sample size for this study. Based on the results of our previous study [12Fujihara Y, Fukunishi S, Fukui T, et al. Use of the G-guide for measuring stem antetorsion during total hip arthroplasty. Orthopedics 2016; 39(2): e271-5. [http://dx.doi.org/10.3928/01477447-20160201-03] [PMID: 268814 66] ], 5° as the difference to be detected and 10° as the standard deviation were adopted as the values used for power analysis. Consequently, it was determined that a sample size of 34 hips would provide 80% power with P < 0.05. Therefore, the sample size of the present study (N: 59) was proven to provide adequate statistical power. The average native femoral AT and correction angle in the study population were 23.5° ± 10.3° and 6.0° ± 1.4°, respectively. In the comparative analysis, the corrected G-guide AV (the sum of the intraoperative G-guide angle and the correction angle), the navigation-measured AV, and the postoperative CT-measured AV values averaged 23.3° ± 8.2°, 16.3°±9.8° and 19.6° ± 10.0°respectively (Table 1). The mean discrepancy between the corrected G-guide and the postoperative CT angles was 5.0° ± 3.9°, while the discrepancy between the navigation and CT angles averaged 5.2° ± 4.1° (Fig. 5 ). The average discrepancy values in the G-guide and navigation measurements were almost the same, and a significant difference was not noted between the two groups (p =0.43). 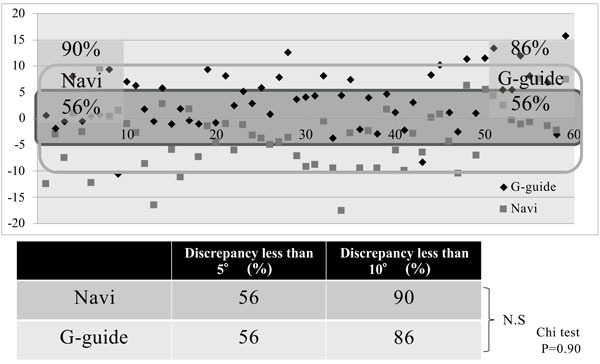 Acceptable accuracy with a discrepancy of less than 5° was achieved in 33 hips (56%) and 33 hips (56%) in the G-guide and the navigation measurement groups respectively, while a discrepancy of less than 10° was attained in 51 hips (86%) and 53 hips (90%) respectively (Fig. 6 ). Similar to the discrepancy results, the rates of acceptable accuracy were almost the same in both groups with no significant intergroup difference detected (p = 0.90). Epicondylar view. The correction angle consisted of the posterior condylar surfaces and the perpendicular line of the lower leg axis. Discrepancy between intra- and postoperative measurements. The absolute discrepancy values between the intraoperative assessment and postoperative CT evaluation are comparatively shown for the Gguide and the navigation system. Scatter plots for the discrepancy between the intra- and postoperative measurements. A discrepancy of less than 5° was achieved in 33 hips (56%) and 33 hips (56%) in the G-guide and the navigation measurement groups respectively, while a discrepancy of less than 10° was attained in 51 hips (86%) and 53 hips (90%) respectively. In THA, implant position is one of the important factors affecting avoidance of dislocation and clinical outcome. Although there have been numbers of studies dealing with cup positioning in THA, the significance of femoral stem AV has not been well addressed in the literature. Recently, the concept of CA, the sum of cup AV and stem AV have been proposed as parameters to assess the appropriateness of the overall implant alignment. In our previous study, 93 primary THAs used image-free navigation for cup positioning, and cup inclination and AV measured postoperatively averaged 40.5°±4.1° and 20.6°±4.6° respectively. Cup positioning could be well-controlled as it showed a small SD value. By contrast, the stem AV was adjusted by the surgeon’s judgment without navigation; therefore, the stem AV averaged 23.6°±11.2° (range 2° -45°) showing a large SD value. Consequently, the resultant CA also showed variation. CA values in 44 hips (43%) were classified into the risky degree (<40° or >60°) for dislocation as proposed by Jolles et al [10Fukunishi S, Fukui T, Nishio S, Fujihara Y, Okahisa S, Yoshiya S. Combined anteversion of the total hip arthroplasty implanted with image-free cup navigation and without stem navigation. Orthop Rev (Pavia) 2012; 4(4): e33. [http://dx.doi.org/10.4081/or.2012.e33] [PMID: 23589761] , 13Jolles BM, Zangger P, Leyvraz PF. Factors predisposing to dislocation after primary total hip arthroplasty: A multivariate analysis. J Arthroplasty 2002; 17(3): 282-8. [http://dx.doi.org/10.1054/arth.2002.30286] [PMID: 11938502] ]. Therefore, determination of stem AV is an important predictor of the longevity of THA, as well as cup alignment. However, intraoperative adjustment of stem AV has conventionally been made by the surgeon under manual and visual controls. This method of assessment/adjustment can be associated with substantial errors and inconsistencies as our previous study revealed. In the studies by Wasssilew et al. and Sendtner et al., wide ranges of resultant stem AV, such as -5° to 39° and -19° to 33°, were reported [14Wassilew GI, Perka C, Koenig C, Janz V, Asbach P, Hasart O. 3D CT analysis of combined cup and stem anteversion in cases of cup navigation in hip arthroplasty. Orthopedics 2010; 33(10)(Suppl. ): 48-51. [http://dx.doi.org/10.3928/01477447-20100510-53] [PMID: 209546 30] , 15Sendtner E, Tibor S, Winkler R, Wörner M, Grifka J, Renkawitz T. Stem torsion in total hip replacement. Acta Orthop 2010; 81(5): 579-82. [http://dx.doi.org/10.3109/17453674.2010.524596] [PMID: 20919811] ]. Based on the postoperative CT measurement results, Wine et al. 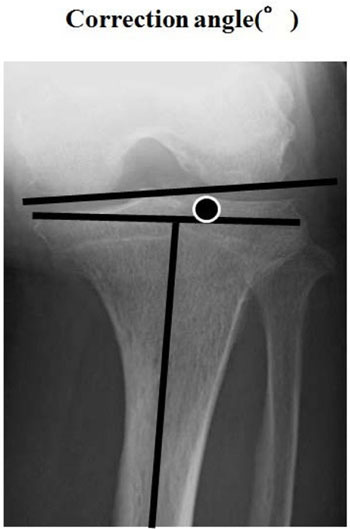 reported that 30% of the manually adjusted femoral stems were positioned out of the physiologic AV angle range (10° to 30°) and stated that surgeons’ intraoperative assessment of femoral stem anteversion is not accurate [16Wines AP, McNicol D. Computed tomography measurement of the accuracy of component version in total hip arthroplasty. J Arthroplasty 2006; 21(5): 696-701. [http://dx.doi.org/10.1016/j.arth.2005.11.008] [PMID: 16877155] ]. On the other hand, variability in the native femoral AV in individuals can be a factor leading to inconsistency in stem AV following THA. With regards to the individual differences in the native femoral AT, Husmann et al. measured femoral AT in 300 patients with primary osteoarthritis before THA, and reported that native femoral AV ranged from 0.29° to 44.5° (SD 8.7°) [17Husmann O, Rubin PJ, Leyvraz PF, de Roguin B, Argenson JN. Three-dimensional morphology of the proximal femur. J Arthroplasty 1997; 12(4): 444-50. [http://dx.doi.org/10.1016/S0883-5403(97)90201-1] [PMID: 9195321] ]. Sugano et al. also reported wide variation in these values ranging from 0° to 50° [18Sugano N, Noble PC, Kamaric E. A comparison of alternative methods of measuring femoral anteversion. J Comput Assist Tomogr 1998; 22(4): 610-4. [http://dx.doi.org/10.1097/00004728-199807000-00019] [PMID: 9676 454] ]. Furthermore, femoral AV in dysplastic hips was larger and more variable than in normal hips [19Perry KI, Berry DJ. Femoral considerations for total hip replacement in hip dysplasia. Orthop Clin North Am 2012; 43(3): 377-86. [http://dx.doi.org/10.1016/j.ocl.2012.05.010] [PMID: 22819165] -24Koerner JD. Femoral version of the general gopulation: Does “normal” vary by gender or ethnicity? J Orthop Trauma 2013; 27: 308-11. ], and Sugano et al reported femoral anteversion with dysplastic hips had 10° to 14° more than normal hips independent to the degree of dislocation of the hip [25Sugano N, Noble PC, Kamaric E, Salama JK, Ochi T, Tullos HS. The morphology of the femur in developmental dysplasia of the hip. J Bone Joint Surg Br 1998; 80(4): 711-9. [http://dx.doi.org/10.1302/0301-620X.80B4.8319] [PMID: 9699842] ]. Hirata et al reported that the average difference between femoral AV and stem AV was 9.8° ± 8.8° and stem AV was in the range of 14 ° to 63.2 ° [26Hirata M, Nakashima Y, Itokawa T, et al. Influencing factors for the increase stem version compared to the native femur in cementless total hip arthroplasty. Int Orthop 2014; 38: 1341-6.]. Bargar et al suggested that the mean stem AV is greater than the mean native femoral AV and that there is no correlation. Therefore, Bargar et al emphasized that the surgeon should not use native femoral anteversion to predict the anteversion of the femoral component [27Bargar WL, Jamali AA, Nejad AH. Femoral anteversion in THA and its lack of correlation with native acetabular anteversion. Clin Orthop Relat Res 2010; 468: 527-32. [http://dx.doi.org/10.1007/s11999-009-1040-2] ]. Regarding the stem design, when the anatomical fit-and-fill type stem in cementless THA is selected as an implant option, the AV cannot be well controlled intraoperatively as it depends on the individual anatomy of the proximal femur [28Emerson RH Jr. Increased anteversion of press-fit femoral stems compared with anatomic femur. Clin Orthop Relat Res 2012; 470(2): 477-81. [http://dx.doi.org/10.1007/s11999-011-1993-9] [PMID: 21786055] ]. On the other hand, Taniguchi et al. reported that the tapered wedge stem significantly increased the stem anteversion compared to the metaphyseal filling stem [29Taniguchi N, Jinno T, Koga D, Hagino T, Okawa A, Haro H. Cementless hip stem anteversion in the dysplastic hip: A comparison of tapered wedge vs metaphyseal filling. J Arthroplasty 2017; 32(5): 1547-52. [http://dx.doi.org/10.1016/j.arth.2016.12.020] [PMID: 28110848] ]. Intraoperative AV adjustment is relatively unrestricted in the use of cemented stem, taper wedge type stem, and Bicontact type stem used in our image-free navigated THA. The femoral implant design is a Bicontact stem that possesses a flat, square cross-section configuration that allows some rotational adjustment. In order to achieve accurate and consistent stem AV adjustment during THA procedure, accurate intraoperative assessment of stem AV is a prerequisite for successful surgical outcome. Hirata et al. reported an absolute discrepancy between estimated stem AV using goniometer and postoperative CT with measurement results of 7.3°±5.7° (range 0° -25°) [30Hirata M, Nakashima Y, Ohishi M, Hamai S, Hara D, Iwamoto Y. Surgeon error in performing intraoperative estimation of stem anteversion in cementless total hip arthroplasty. 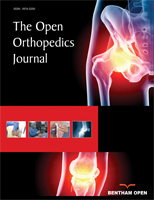 J Arthroplasty 2013; 28: 1648-53.]. Intraoperative surgical navigation has been introduced intending to improve surgical accuracy. Kitada et al. examined the accuracy of stem AV achieved by the use of CT-based navigation as referenced to the postoperative CT measurement, and reported acceptable accuracy with a discrepancy of less than 5° and 10° in 79% and 97% of the cases respectively [31Kitada M, Nakamura N, Iwana D, Kakimoto A, Nishii T, Sugano N. Evaluation of the accuracy of computed tomography-based navigation for femoral stem orientation and leg length discrepancy. J Arthroplasty 2011; 26(5): 674-9. [http://dx.doi.org/10.1016/j.arth.2010.08.001] [PMID: 20870379] ]. Hayashi et al. reported that the use of a CT-based fluoro-matched navigation could offer a similar level of accuracy with a discrepancy of less than 10° in 91% of the examined subjects [32Hayashi S, Nishiyama T, Fujishiro T, et al. Evaluation of the accuracy of femoral component orientation by the CT-based fluoro-matched navigation system. Int Orthop 2013; 37(6): 1063-8. [http://dx.doi.org/10.1007/s00264-013-1852-2] [PMID: 23512603] ]. Andrea et al. reported that the average difference between native femoral AV and stem AV was 1.6°±9.8° with uncemented single-wedge straight stem in robotic surgery [33Marcovigi A, Ciampalini L, Perazzini P, Caldora P, Grandi G, Catani F. Evaluation of native femoral neck version and final stem version variability in patients with osteoarthritis undergoing robotically implanted total hip arthroplasty. J Arthroplasty 2019; 34(1): 108-15. [http://dx.doi.org/10.1016/j.arth.2018.06.027] [PMID: 30017219] ]. In our previous study with image-free navigation for stem AV, Takeda et al. reported that the absolute discrepancy of stem AV between navigation value and postoperative CT evaluation was 5.7°± 4.5° [34Takeda Y, Fukunishi S, Nishio S, Fujihara Y, Yoshiya S. Accuracy of component orientation and leg length adjustment in total hip arthroplasty using image-free navigation. Open Orthop J 2017; 11: 1432-9. [http://dx.doi.org/10.2174/1874325001711011432] [PMID: 29387288] ], and reported satisfactory accuracy in the assessment of stem AV. 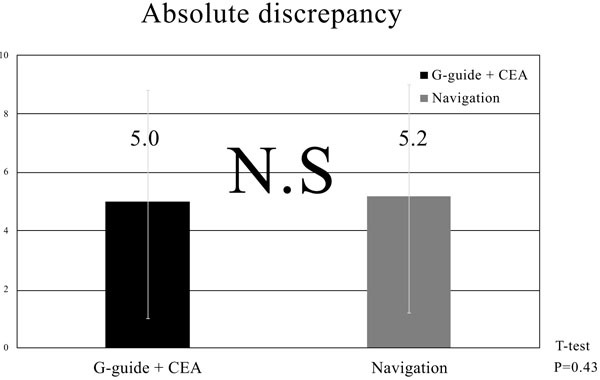 Based on those study results, accuracy and utility of navigation in intraoperative assessment and adjustment have been proven in the literature; however, navigation systems are costly and require additional space, time and effort.The present study compared the accuracy of the two intraoperative measurement systems for femoral stem AV, the G-guide and image-free navigation systems, and showed equally satisfactory performances for both systems. Both systems enabled fairly accurate AV measurements with an average discrepancy between the measured and reference values of 5°, and achieved acceptable accuracy with a measurement error of less than 10° in 90% of the cases. The discrepancy between the intra- and postoperative measurements of stem AV with G-guide is larger than that attained by the CT navigation system and robotic surgery. Considering the level of accuracy that is achievable during the actual surgery, however, the average discrepancy of 5.0° in this study seems to indicate acceptable clinical accuracy. Therefore, the G-guide system can be considered as a reliable tool to consistently achieve desirable stem AV during the THA procedure. There are some issues in this study to be considered when analyzing the obtained results. First, there are differences in the reference line during the AV angle measurement among the three methods (G-guide, navigation, and CT measurements). In the CT measurement, the posterior condylar tangential line was used as reference. The G-guide system measures the angle between the long axis of the lower leg and the orientation of the rasp. Therefore, the measured AV angle needs to be corrected incorporating the coronal plane angle between the perpendicular line to the lower leg (tibial) axis and the reference line (posterior condylar line) in the femoral condyle. During AV assessment using the navigation system, the reference plane is defined by the perpendicular plane with respect to the registration plane that is determined by the three points (femoral head center, knee center and ankle center). And stem AV is defined as the angle between the vector of the reference plane and stem neck axis projected on the transverse plane. Consequently, a subtle discrepancy in the reference for AV measurement is present between the navigation and CT assessments, which was not incorporated in the analysis of this study. Second, in the G-guide measurement, the assumption of a correspondence between the long axis of the instrument and that of the tibia can be a source of error. In addition, determination of the correction angle using the preoperative epicondylar view radiograph can be inaccurate especially in patients with severe osteoarthritic deformity of the knee or tibial bowing. Third, regarding the potential sources of errors in navigation measurement, loosening of the clamp at the major trochanter and registration error before surgery may affect the assessment accuracy. Another limitation of this study design was the concern for the adequacy of the sample size; however, since the calculated values for the G-guide and the navigation were almost identical, it does not seem likely that a difference between the two groups can be detected by increasing the sample size. The G-guide system can provide comparable accuracy for the assessment of femoral stem AV during THA as compared to the navigation system. Therefore, this system can be used as a useful intraoperative device to consistently attain desirable stem AV. This study has been approved by the research Institutional Review Board of Hyogo College of Medicine. (Permission number: 2198) Hyogo, Japan. The authors thank Mr. Devin Casadey for his assistance in English language editing. Koerner JD. Femoral version of the general gopulation: Does “normal” vary by gender or ethnicity? J Orthop Trauma 2013; 27: 308-11. Hirata M, Nakashima Y, Itokawa T, et al. Influencing factors for the increase stem version compared to the native femur in cementless total hip arthroplasty. Int Orthop 2014; 38: 1341-6. Hirata M, Nakashima Y, Ohishi M, Hamai S, Hara D, Iwamoto Y. Surgeon error in performing intraoperative estimation of stem anteversion in cementless total hip arthroplasty. J Arthroplasty 2013; 28: 1648-53.